Proxima Centauri has become the subject of intense study since the radial-velocity discovery by Anglada-Escud\'e et al. 2016 of a planet orbiting this nearby M-dwarf every ~ 11.2 days. If Proxima Centauri b transits its host star, independent confirmation of its existence is possible, and its mass and radius can be measured in units of the stellar host mass and radius. To date, there have been three independent claims of possible transit-like event detections in light curve observations obtained by the MOST satellite (in 2014-15), the BSST telescope in Antarctica (in 2016), and the Las Campanas Observatory (in 2016). The claimed possible detections are tentative, due in part to the variability intrinsic to the host star, and in the case of the ground-based observations, also due to the limited duration of the light curve observations. Here, we present preliminary results from an extensive photometric monitoring campaign of Proxima Centauri, using telescopes around the globe and spanning from 2006 to 2017, comprising a total of 329 observations. Considering our data that coincide directly and/or phased with the previously published tentative transit detections, we are unable to independently verify those claims. We do, however, verify the previously reported ubiquitous and complex variability of the host star. We discuss possible interpretations of the data in light of the previous claims, and we discuss future analyses of these data that could more definitively verify or refute the presence of transits associated with the radial-velocity discovered planet. Whelp, ... there go the debris disks. We present new analyses of ALMA 12-m and ACA observations at 233 GHz (1.3 mm) of the Proxima Centauri system with sensitivities of 9.5 and 47 μJy beam−1, respectively, taken from 2017 January 21 through 2017 April 25. These analyses reveal that the star underwent a significant flaring event during one of the ACA observations on 2017 March 24. The complete event lasted for approximately 1 minute and reached a peak flux density of 100±4 mJy, nearly a factor of 1000× brighter than the star's quiescent emission. At the flare peak, the continuum emission is characterized by a steeply falling spectral index with frequency, Fν∝να with α=−1.77±0.45, and a lower limit on the fractional linear polarization of |Q/I|=0.19±0.02. Since the ACA observations do not show any quiescent excess emission, we conclude that there is no need to invoke the presence of a dust belt at 1−4 AU. We also posit that the slight excess flux density of 101±9 μJy observed in the 12-m observations compared to the photospheric flux density of 74±4 μJy extrapolated from infrared wavelengths may be due to coronal heating from continual smaller flares, as is seen for AU Mic, another nearby, well-studied, M dwarf flare star. If this is true, then the need for warm dust at ∼0.4 AU is also removed. Ouch. And it's plausible the ~30 AU belt is due to background sources as well. On the upside, that might make transits a (slightly) more realistic possibility. Proxima b is a terrestrial-mass planet in the habitable-zone of Proxima Centauri. Proxima Centauri's high stellar activity however casts doubt on the habitability of Proxima b: sufficiently bright and frequent flares and any associated proton events may destroy the planet's ozone layer, allowing lethal levels of UV flux to reach its surface. In March 2016, the Evryscope observed the first naked-eye-visible superflare detected from Proxima Centauri. Proxima increased in brightness by a factor of ~68 during the superflare and released a bolometric energy of 10^33.5 erg, ~10X larger than any previously-detected flare from Proxima. Over the last two years the Evryscope has recorded 23 other large Proxima flares ranging in bolometric energy from 10^30.6 erg to 10^32.4 erg; coupling those rates with the single superflare detection, we predict at least five superflares occur each year. Simultaneous high-resolution HARPS spectroscopy during the Evryscope superflare constrains the superflare's UV spectrum and any associated coronal mass ejections. We use these results and the Evryscope flare rates to model the photochemical effects of NOx atmospheric species generated by particle events from this extreme stellar activity, and show that the repeated flaring is sufficient to reduce the ozone of an Earth-like atmosphere by 90% within five years. We estimate complete depletion occurs within several hundred kyr. The UV light produced by the Evryscope superflare therefore reached the surface with ~100X the intensity required to kill simple UV-hardy microorganisms, suggesting that life would struggle to survive in the areas of Proxima b exposed to these flares. Well, this kind of thing probably goes some way to explain why we find ourselves orbiting a G-type star instead of the far more common M-dwarfs. Hopefully whatever's at Proxima has factor nine billion sunblock. Mass of Proxima Centauri as determined by microlensing is 0.150+0.062-0.051 solar masses, which would increase the minimum mass of Proxima b to 1.56+0.064-0.053 Earth masses. The candidate transit signal does not appear to have been caused by a background eclipsing binary. Proxima Centauri was recently discovered to host an Earth-mass planet of Proxima b, and a 215-day signal which is probably a potential planet c. In this work, we investigate the dynamical evolution of the Proxima Centauri system with the full equations of motion and semi-analytical models including relativistic and tidal effects. We adopt the modified Lagrange-Laplace secular equations to study the evolution of eccentricity of Proxima b, and find that the outcomes are consistent with those from the numerical simulations. The simulations show that relativistic effects have an influence on the evolution of eccentricities of planetary orbits, whereas tidal effects primarily affects the eccentricity of Proxima b over long timescale. Moreover, using the MEGNO (the Mean Exponential Growth factor of Nearby Orbits) technique, we place dynamical constraints on orbital parameters that result in stable or quasi-periodic motions for coplanar and non-coplanar configurations. In the coplanar case, we find that the orbit of Proxima b is stable for the semi-major axis ranging from 0.02 au to 0.1 au and the eccentricity being less than 0.4. This is where the best-fitting parameters for Proxima b exactly fall. 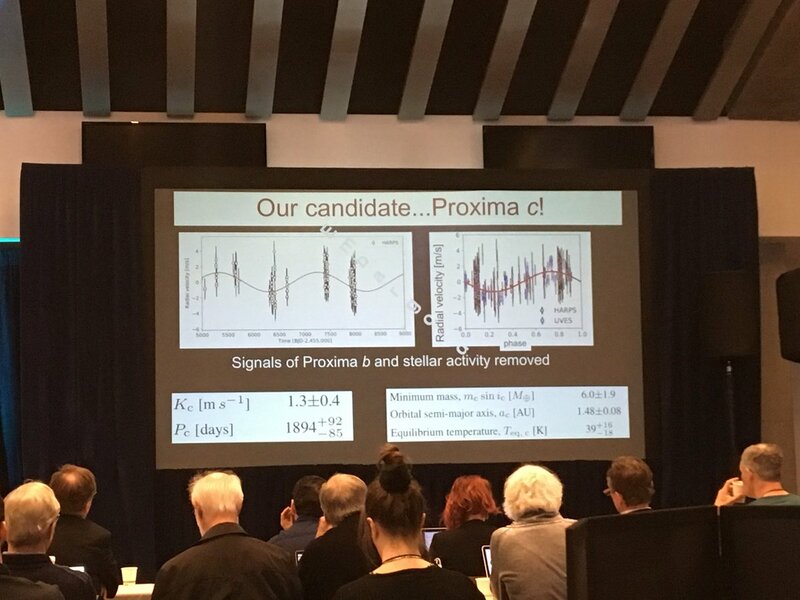 Additional simulations show that the robust stability of this system would favor an eccentricity of Proxima b less than 0.45 and that of Proxima c below 0.65. In the non-coplanar case, we find that mutual inclinations of two planets must be lower than 50∘ in order to provide stability. Finally, we estimate the mass of Proxima c to be 3.13 M⊕≤mc≤70.7 M⊕ when 1.27 M⊕≤mb≤1.6 M⊕, if imutual≤50∘ and ΔΩ=0∘. dramatically limits optical precision. However, the effect of flares is much reduced in the infrared. We observed the system with the Spitzer Space Telescope's Infrared Array Camera in November 2016. Our first observation was a 48-hour stare at 4.5 um. It was centered on the predicted transit and covered the 99% credible region for the transit time, based on the discovery radial-velocity (RV) data. Despite a transit-depth precision of ~0.01% for a 1 hour transit, we did not detect the predicted 0.5% transit. There was structure in the light curve, including some asymmetric transit-like features, that led us to conduct follow-up observations in May, June, July, and November 2017. None of these observations contained detections, once we accounted for a new manifestation of systematics due to spacecraft vibration. Our improved methods for identifying and partly removing this effect is the topic of the next presentation. under a contract with NASA. This work was supported by NASA Planetary Atmospheres grant NNX12AI69G and NASA Astrophysics Data Analysis Program grant NNX13AF38G. Using a global network of small telescopes, we have obtained light curves of Proxima Centauri at 329 observation epochs from 2006 to 2017. The planet Proxima b discovered by Anglada-Escude et al. (2016) with an orbital period of 11.186 d has an a priori transit probability of ~ 1.5%; if it transits, the predicted transit depth is about 5 millimagnitudes. In Blank et al. (2018), we analyzed 96 of our light curves that overlapped with predicted transit ephemerides from previously published tentative transit detections, and found no evidence in our data that would corroborate claims of transits with a period of 11.186 d. Here we broaden our analysis, using 262 high-quality light curves from our dataset to search for any periodic transit-like events over a range of periods from 1 to 30 d. We also inject a series of simulated planet transits and find that our data are sufficiently sensitive to have detected transits of 5 millimagnitude depth, with recoverability ranging from ~100% for orbital period of 1 d to ~20% for orbital period of 20 d for the parameter spaces tested. The recoverability specifically at the 11.186 d period of Proxima b is ~ 40% for the parameter spaces tested. While we are able to rule out virtually all transits of other planets at periods shorter than 5 d and depths greater than 5 millimagnitudes, we cannot rule out the possibility that transits of Proxima b are present but escaped detection. However, we are able to rule out virtually all transits of other planets at periods shorter than 5 d and depths greater than 3 millimagnitudes. Possible second planet with six earth-masses at 1900 days (~1.5 AU). If real, it's accessible to both Gaia and direct-imaging.